Crack a nail? No problem. This nail polish will revolutionize the way you think about a chipped manicure. 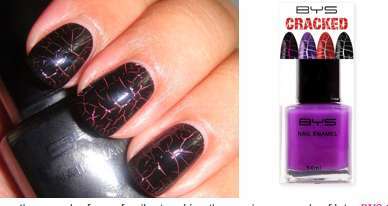 The BYS Cracked Nail Polish (currently only being sold in Australia), is actually made to crack upon applying and drying. It comes in 4 shades: purple, red, and black all with white cracks, as well as black with hot pink cracks. 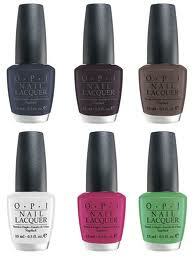 6 of your favorite OPI colors (Russian Navy, Lincoln Park After Dark, You Don’t Know Jacques!, Alpine Snow, La Paz-Itively Hot and Gargantuan Green Grape) come in a matte finish. Don't use base coat or top coat; just apply two coats of whichever color you choose. I personally like Alpine Snow for summer and Lincoln Park After Dark for fall (the most classic OPI color ever, in my opinion). The matte finish is a great way to spice up your standard manicure.